„We want to show that there is a serious opposition in Croatia and a serious political alternative that can act against populism and rightist radicalism. 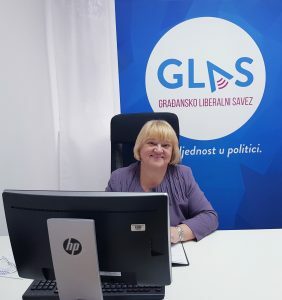 We are committed to Croatia that respects the equality of all its citizens, fosters creativity and entrepreneurship, and supports the weak and disenchanted“ says Anka Mrak Taritaš, the head of the political alliance Glas. „The main reason why Glas, IDS and the Pametno political party came together in the so-called Amsterdam Coalition, are the ideas of freedom and the right of every individual to live in a free and open society“, says our interlocutor. The Coalition members agreed on a joint participation in three elections – European, presidential and parliamentary. 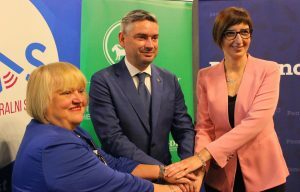 What novelties is this alliance bringing to the Croatian political stage? You have joined forces on an idea of a consistent defence of liberal values and representation of a decent and civil Croatia. Is there room for these ideas today considering that in a number of democracies with a much longer tradition such values take back seat to populism that attracts more voters? Populism, as you yourself said it, is not just Croatia’s problem. This is a serious problem faced by Europe and the countries with a much greater democratic tradition than us. The elections in France and the Netherlands have shown that liberal parties, thanks to their election victory, have stopped the growing trend of populism and the right-wing radicalism in their respective countries. The Liberals are actually a defence line against growing populism in Europe. Traditional left and right parties are no longer able to play that role. This problem needs to be taken seriously as the situation in Italy shows that the trend continues to exist. Furthermore, we can see that Poland and Hungary already have the so-called non-liberal democracies which took over from democracy only as a mechanism for the majority to form a government. Once that is done, they use it mostly to abolish the fundamental values ​​of liberal democracy, to overthrow the rights of minorities and other basic human and civil rights, to overturn the reproductive rights of women, freedom of the media and so on. You have announced a big campaign for European elections as of autum. What kind of Croatia would you like to see in the EU? Our three parties have assembled around the idea of freedom and the rights of every individual to live in a free and open society, in a well-regulated country that respects the equality of all its citizens, encourages creativity and entrepreneurship, and, when required, can support the weak and disenchanted. I want to see that kind of Croatia. What is also important is what kind of Europe do we want? The European Union is awash with problems and we want more of Europe and more of common European policies. We want to seriously participate in the reform of the European Union. The European Union needs a stronger integration in terms of common foreign and defence policy, and in the economic sense, Europe must become a much more serious global player, standing shoulder-to-shoulder with the US, Russia and China. What European values do we lack in Croatia? There are ongoing retrograde processes in the Croatian society, and the values that we thought we had mastered and that we would not have to discuss again have now come into question. What we can see in the making is a crawling conservative revolution that jeopardizes the values such as equality of all citizens, individual freedom and the right of women to decide what to do with their own bodies. Also, anti-fascism, as the civilizational heritage that modern Europe rests on, is endangered here. In short, Croatia lacks the fundamental values of liberal democracy. You said that as a coalition you „want to be a smart and reasonable voice for Croatia”. In what segments do we need ideas that are different to today’s? Croatia needs serious reforms in a number of areas, but above all, we need to reform science and education, state and local self-government and we need a serious tax reform. Unfortunately, the education reform, that was led by Boris Jokic during the time of the left-centre coalition government, fell through with the appointment of the new government. In order to make Croatia competitive in every respect, we must educate for the future and develop knowledge and skills for the professions that are just coming. We have to teach critical thinking, instead of just mechanically memorizing unnecessary facts. We need to make state administration more efficient and accessible to citizens and businesses, and reduce the number of counties, cities and municipalities by reforming local and regional self-government. Regarding the tax system reform, Croatia is one of the countries with the highest tax burden in the European Union, and the services provided by the state do not match the paid taxes. I think we need a serious tax relief on labour costs and to unburden businesses in terms of unnecessary parafiscal charges. Although, you had made it to the second round of the mayoral elections in Zagreb, the electorate has decided to elect a long-time mayor for the sixth time. Did this bother you or encourage you in terms of the electorate you are trying to reach? What did you learn when it comes to an effective campaign? I have no objections to the entire campaign which I did with my team. In the end, and regardless of the result, I’m proud of everything we’ve done. It’s no small feat to start with only 5% of the electoral support and end just a step away from victory. Unfortunately, I’m afraid that my team and I were alone in the second round so we could not win. Our own party, HNS had negotatied a coalition with HDZ at the national level which ruined the chances of our success in Zagreb. Our peers from SDP have been experiencing internal problems for a long time which could be seen in the campaign. On the other side of the spectrum, there was a candidate with the available campaign budget of almost HRK 16 billion who used his function as a mayor in every aspect of the campaign. That battle was not equal from the get go and my result, despite everything, is something that I can be happy with. Nobody has ever come that close to beating the current mayor. What would Zagreb still need to do to improve the quality of life of its citizens and what are the biggest problems that you would solve differently than the current government? Zagreb chronically misses transparency in management. Everything is concentrated in the hands of one man, the mayor, and he has the last say. There is this notion that mayor is giving out or donating things, but that is actually the budget money and the services that the city simply has to provide to its citizens. There have been no serious infrastructural projects in the city in the last 17 years, and the mayor creates the impression that he works a lot which he is very vocal about. In Zagreb alone, 30,000 citizens or 10,000 households do not have sewage. We are talking about the population that is the size of Koprivnica or Daruvar. Money is used to build a fountain and carry out cosmetic touches in the city, or for the mayor to travel to Rome 62 times, while the citizens do not have the basic utility infrastructure. Zagreb needs to be seriously reset and I’m so sorry that we will have to wait three years to do this. 8. The media have been speculating that you could be a new candidate for the presidential election when that time comes, and that you did not confirm or deny this possibility. What would have to happen for you to agree to run for president? I must admit that I do not think about presidential candidacy, but that I also did not definitively eliminate this possibility because I have learned that political circumstances can always be surprising. It is difficult now to say which circumstances would have to align in order for me to run for president, but never say never.